Betting on League of Legends: which bookie is best? In the last few years League of Legends has grown into the most popular online video game. There are currently more LoL players in the world than people living in France. As the game has grown in popularity so has the demand for betting on League of Legends. This article will help you pick the best operator. Note: EGB and Vulcun are dedicated eSports operators and only offer markets on video game competitions. With normal sportsbook betting the overall competition winner is one of the most common markets. When it comes to eSports, and betting on League of Legends this market is far less common, and often only appears towards the latter stages of the competition. When it comes to picking the operator with the best odds, there are two options: backing the favourite, or backing the outsider. For outsider betting Betway and Bet365 typically offer much better value for your wager. If you want to put your money on the favourite then all four offer very similar odds. All the major bookies will also run markets on some of the most popular, and biggest eSports events, such as the World Championship and the official LCS league. 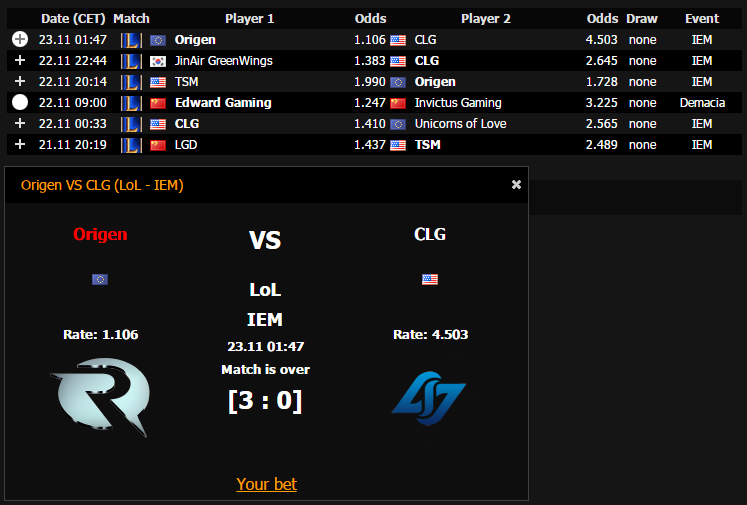 Match outcome markets are by far the most common when it comes to betting on LoL, and many bookmakers, even ones that offer very little eSports wagering, will feature match winner odds. Bet365 offer the best odds on the winner, although EGB and Betway's odds are still competitive. When backing the outsider, Betway and EGB offer betting value for a winning wager. Vulcun's market functions a little differently to the other three. Odds are dictated by a percentage and to make a wager you simply drag the slider along to determine how much you wager. Vulcun's wagering can be done with real money, or Vulcun gold, a unique currency that allows punters to purchase in-game items for League of Legends. Wagering on individual maps is not a market that every operator offers for League of Legends. Egaming Bets and Vulcun both lack this option, although the latter does offer other wagering options, such as the first team to reach a certain amount of kills, or which player will be top of the leaderboard after each round. Betway and Bet365 offer map outcome markets, and both allow viewers to follow the progress of a match through their website, although most viewers will prefer to view through Twitch. Bet365 and Betway have very similar odds for favourites, while Bet365 are the better choice for outsider betting. All four operators offer a range of promotions for new and existing users, some of which can be used to increase the amount available to you for betting on League of Legends. Thanks to Betminded's unique MAXBET promo code new Vulcun users who want to start betting on League of Legends can get an exclusive free gift. This gift consists of a random set of in-game items for League of Legends players. 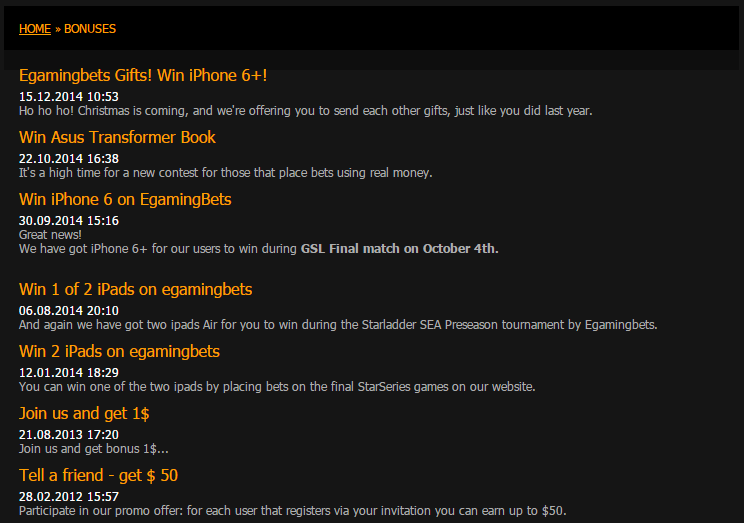 Egaming Bets features a huge amount of prize draws and giveaways, which existing users can enter. These include iPad and iPhone giveaways, referral bonuses ($50) and more. Entry requirements differ for each competition, however the winner is usually the player who has placed the most correct bets in a given time period. Bet365 and Betway's offerings are restricted to more general sportsbook bonuses. 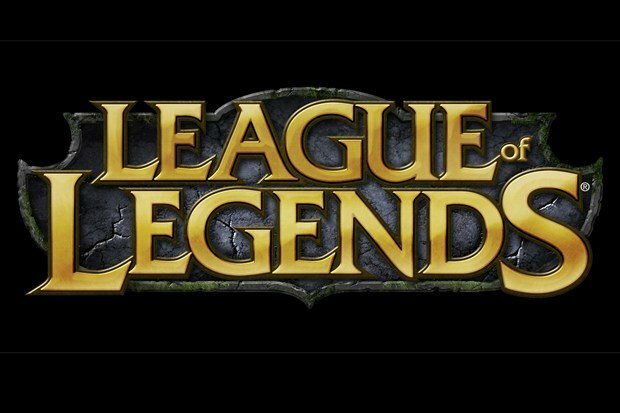 Betminded » Online Betting guide » Betting on League of Legends: which bookie is best?